I’ll be the first to admit that so far this year, my life has been…comical. A chain of events that would make for a decent storyline in a sitcom…like how my purse was stolen from a popular Canada-based donut/coffee chain by an employee, then the ridiculousness that followed was…well, it was something. Or how our move to Italy has been changed/postponed/changed back, etc…more times than I can possibly count. My point is, everyone has those days where if you can’t laugh about it, you’ll cry. Those days where you just want to curl up on the couch and ignore the piles of laundry and dishes, and just enjoy something delicious in peace. 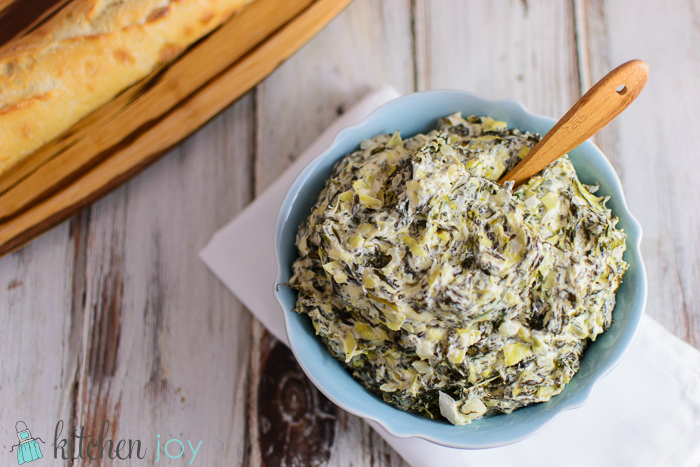 This recipe for Spinach-Artichoke Dip is perfect for those days where you don’t feel like making something elaborate, but you’ve got to have a little something to munch on while you binge-watch Law & Order on Netflix. Plus, as always, it’s WAY better than store-bought, and much less expensive. No complicated ingredients, just things that you might already have in your fridge and pantry. Plus it’s made in the slow-cooker! (I know, I know, I’m not usually a crock pot super-fan, but it is perfect for this recipe.) It got the “Coffee Day” seal approval by a big group of ladies in my life that meet on a weekly basis, so I’m sure you’ll love it too. Add all ingredients except the cream cheese to the slow cooker. Stir to combine. Place cream cheese cubes on top of spinach mixture. Cook on low heat for 2 hours, then stir to combine the cream cheese with the other ingredients. Add salt and pepper to taste, if needed. Raise heat to high and cook 15 more minutes. 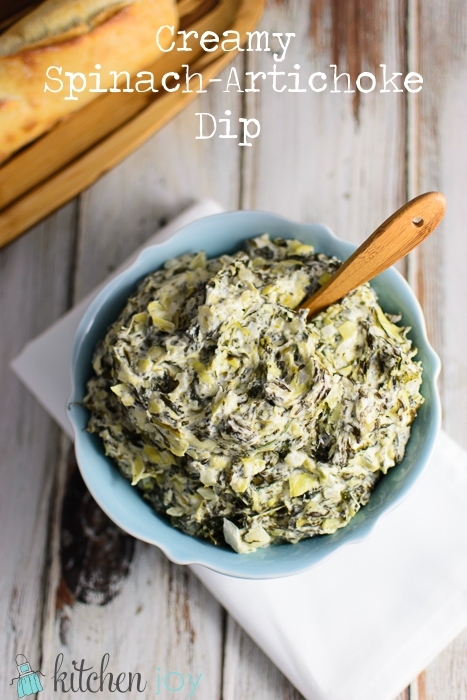 Serve with tortilla chips, pita chips, bagel chips, French bread, or whatever you like. Feel free to use a nice melting cheese of your choice. I happen to love Asiago Fresco (fresh Asiago), which is a softer, milder variety of Asiago that melts very well. It is not hard like Parmesan. Don't substitute aged Asiago...it is too hard and won't melt and turn out as creamy as the fresh variety.